Ellis exhibited both oil and watercolour paintings. Given his taste for working out of doors, before nature, some of his best and most rewarding pictures are in watercolour. 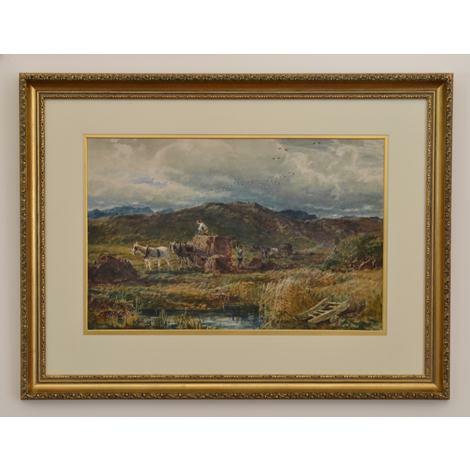 Here, Ellis has woven together the texture and hue of the clouds, a mountainous horizon, grasses, water, reflections, smoke, a wonderful flock of lapwings - and, at the centre, two patient horses and a group of busy figures, heaving peat onto a cart. The picture probably dates from the mid-1880s. By this time, Ellis was less concerned than he had been with the difficult lives of the working poor. He was more interested in the quality of his paint, the pattern of his brushmark, the harmonies of his colour. Ellis's watercolours were criticised for their sketchy, Impressionist drawing. But they were admired for the way in which the artist captures the weather, light and atmosphere with such authority.